Scientific and medical knowledge is ever-changing. The authors, artists and publisher have attempted to provide information that is complete and in accord with the standards accepted at the time of the publication. However, in view of the possibility of human error by the authors, artists, or publisher in the material herein, or changes in scientific and medical knowledge, neither the authors, artists, or publisher, nor any other party who has been involved in the preparation of this work, warrants that the information contained herein is in every respect accurate or complete, and they are not responsible for any errors or omissions or for the results obtained from use of such information. Medicine is an ever-changing science undergoing continual development. Research and clinical experience are continually expanding our knowledge, in particular our knowledge of proper treatment and drug therapy. Insofar as there is any mention of a dosage or clinical application, this does not involve, imply, or express any guarantee or responsibility on the part of the authors or publisher in respect of any dosage instructions and forms of clinical application stated herein. 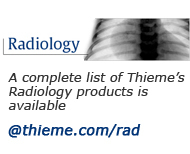 Every user is requested to examine carefully the manufacturers' leaflets accompanying each drug and to check, if necessary in consultation with a physician or specialist, whether the dosage schedules mentioned therein or the contraindications stated by the manufacturers differ from the statements made in Radcases.thieme.com. Such examination is particularly important with drugs that are either rarely used or have been newly released. Every dosage schedule or every form of application used is entirely at the user's own risk and responsibility. The authors and publisher request every user to report to the publishers any discrepancies or inaccuracies noticed in the material contained herein.